Welcome to DSU 2013 website. Please explore this website to learn more about the workshop. The website will be costantly updated with more information. Thank you for visiting, and we hope to see you at DSU 2013. 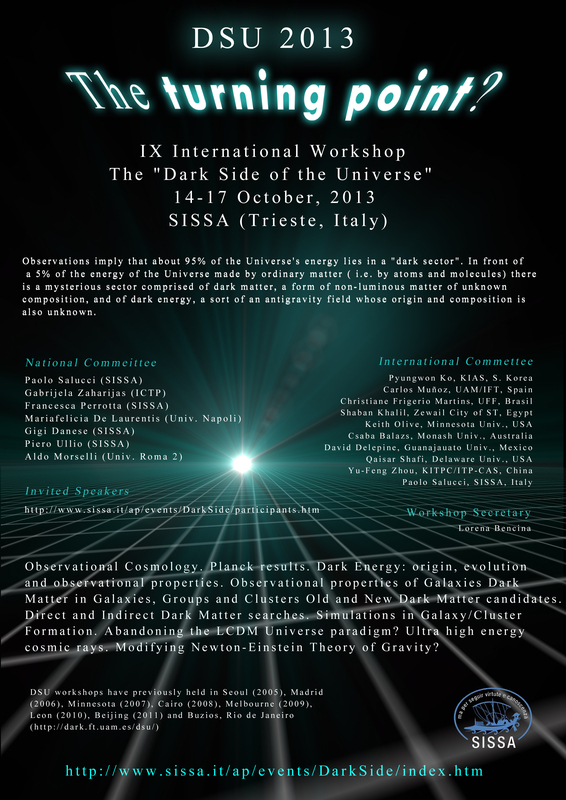 Dark Energy: origin, evolution and observational properties. Dark Matter in Galaxies, Groups and Clusters. Old and New Dark Matter candidates. Direct and Indirect Dark Matter searches. Abandoning the LCDM Universe paradigm? Ultra high energy cosmic rays. Modifying Newton-Einstein Theory of Gravity?